One from the line, two in the lane and three from the arc. It’s basketball, only from a very different point of view. Emily Voorde ’15 started her wheelchair basketball career as a teenager, playing in a Tuesday night league at South Bend’s Newman Recreation Center. Her gender and her osteogenesis imperfecta, also known as brittle bone disease, didn’t prevent her from keeping up with her all-male competition. When she arrived on campus as a freshman, Voorde moved into Ryan Hall. Opened in 2009, this women’s dorm is sometimes referred to as “Hotel Ryan,” a nod to the building’s luxe furnishings and large rooms. Voorde was impressed for a different reason: The hall was designed with accessibility in mind. Eleven of the University’s 29 residence halls are wheelchair accessible, but Ryan takes accessibility to the next level. The hallways are wider. Two elevators serve different wings of the dorm. Each bathroom has two accessible stalls, and some rooms are equipped with a pedestal-style sink that a wheelchair user can roll up to. Even the carpets change patterns and textures around hallway corners so students with visual impairments may anticipate the change in direction. 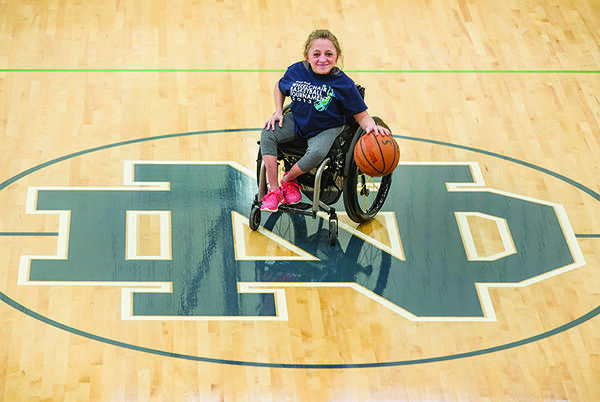 It was in Ryan Hall that Voorde had the idea to bring wheelchair basketball to Notre Dame on a campus-wide scale. The inaugural Ryan Hall Wheelchair Basketball Tournament took place during the 2012 spring semester. Only 18 teams participated, and most of the players were Ryan Wildcats. Alick’s Home Medical, a South Bend company, loaned the chairs for the games, and the hall donated the proceeds from the $5 entry fee to the Wheelchair Foundation, a California-based organization that buys wheelchairs in bulk and donates them to those in need. Taking typical, competitive Notre Dame students and putting them in a wheelchair competition offered an atypical University experience. Wheelchairs currently provide mobility for the six students, including Voorde, who use them to navigate campus. In its second year, participation in the tournament tripled from 18 to 54 teams. For the 2014 tournament, the number rose to 64 teams, which included students from male and female dorms across campus. Finding enough teams to make a perfect bracket used to be unimaginable. Now, the organizers are on a roll. It’s the same game and the points count the same way. Giving back just makes them count a little bit more. The 2015 Ryan Hall Wheelchair Basketball Tournament will be April 12. Madeline Gore is this magazine’s spring 2015 intern. Originally published by Madeline Gore ’15 at magazine.nd.edu on April 06, 2015.